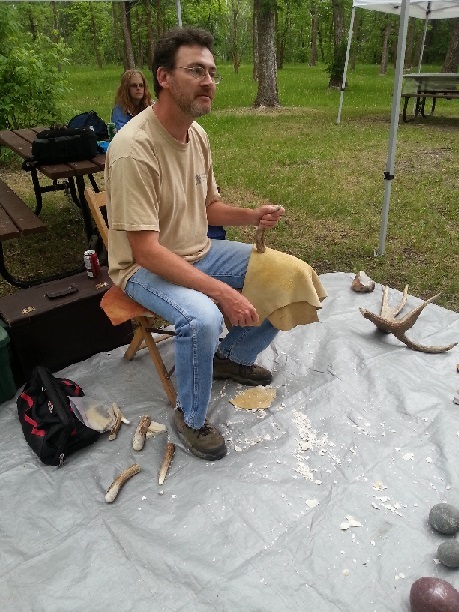 Chris Whaley has worked in the field of archaeology for over 28 years as a subcontractor for archaeological consulting firms and other institutions within the discipline, such as the Manitoba Government, the Manitoba Museum, the University of Winnipeg, and the University of Manitoba. He specializes in the identification of cultural materials (artifacts) and stone tool technology, and is an accomplished flint knapper. Chris has great interest in public education, and enjoys speaking and conducting presentations and workshops about archaeology and cultural heritage to First Nations communities, schools and universities, and the general public at various heritage events throughout Manitoba. Archaeologists can help people solve problems by studying how climate change has influenced humans in the past, and how past humans have influenced global climate. For my PhD, I will take a step toward confirming or denying that humans caused the Little Ice Age. It is well known from archaeology and history that, when European diseases were introduced to the indigenous peoples of the Western Hemisphere, there was major loss of population. There is also a growing body of evidence from geography that, while epidemics were causing a demographic collapse, forests regrew and reclaimed abandoned villages. Several geographers argue that this growth of forests removed enough carbon from the air to cause the Little Ice Age. Several scientists have estimated the effect that reforestation across the Western Hemisphere had on global climate, but the only data is from Mexico. I am going to take a step toward rectifying that problem by studying the effect of epidemics on global climate in the Pacific coast of British Columbia, from 1770 to 1900. I hope to tie this research into current research on the effect of planting trees on contemporary climate change. I also hope to collaborate with local First Nations. By seeking their approval before doing research, and by sharing my findings with them, I can build positive relationships across ethnic lines. I can also incorporate their traditional knowledge into my own research, and create something that has meaning to them and that will help them educate their children about their ancestors and keep their cultural heritage alive. I did my undergrad in anthropology and linguistics at the University of Manitoba, and a master's degree in archaeology at Durham University in England. I have participated in archaeological excavations in Canada, Poland and Italy, and I have done archaeological research at The Manitoba Museum, the British Museum and the Victoria and Albert Museum. I am now going to do a PhD in Geography and Anthropology at Durham University. I am currently a volunteer at the Manitoba Archaeological Society, and I contribute essays on archaeology to their website.